A previous Woodshop Wednesday put a spotlight on the chop saw, used to cut dimensional lumber and other skinny materials swiftly to length. It’s a great tool, saves a ton of time, but truly it’s a luxury to have one… many carpenters get by without. That’s because there exists another tool that can do everything the chop saw can and much, much more: the circular saw. Colin rips 3/4-inch plywood with a circular saw. Also known on site by the trade name “Skil Saw,” the lazy-speaker “circle saw,” and the mock-foreign “saw du circulaire,” the circular saw is lightweight, portable, and unbelievably versatile. It can make a cut of any length, at any angle, to any depth up to about 2 inches through a variety of materials. (Just remember to set the blade to the angle and depth you want.) It’s really the only sensible way to rip long cuts through plywood or foam, and since you can carry it easily with one hand it fills in for more specialized tools in hard-to-reach places. 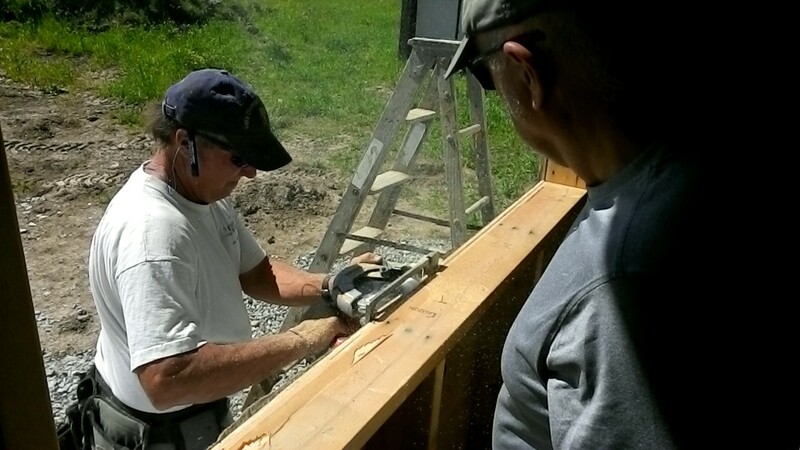 When we’re working on the roof of the main house, for example, and Terry needs a 72-inch 2×6 to brace between rafters, it makes no sense for Colin to hike downstairs, go out to the Barn, and turn on the chop saw. Much faster for Colin to measure a piece of lumber right there and slice through with Mr. Circular Saw. It saves a solid minute on every cut, particularly in situations where precision isn’t a major concern. And therein lies the main problem with the circular saw: it’s hard to cut exactly where you want to. I always draw a pencil or chalk line the entire length of my intended cut, rather than just one mark. This gives me something to trace with the saw so I can keep an eye on the blade while I cut. (Remember: the blade WANTS to chop off your fingers, so don’t ever give it a chance.) But the line I draw has some thickness to it, and the blade itself is about 1/8 inch thick, so I must consider: do I cut just to the left of my line? Right down the middle? To achieve my measurement should I leave the line visible on the cut piece? (A common instruction we use to cut, say, 72 1/16 inches is “72, leave the line.” In our early days on site I measured with an engineer’s precision and drew chuckles.) Finally, once I’ve decided where to make my cut, I need to make the saw actually go where I want it to. A perfect rip requires a dexterity gained only from experience, especially when the cut is so long you need to physically crawl across the wood without losing your straight line. Trimming dimensional lumber on two angles to make a truss diagonal. Makeshift planer: trimming a rough opening. 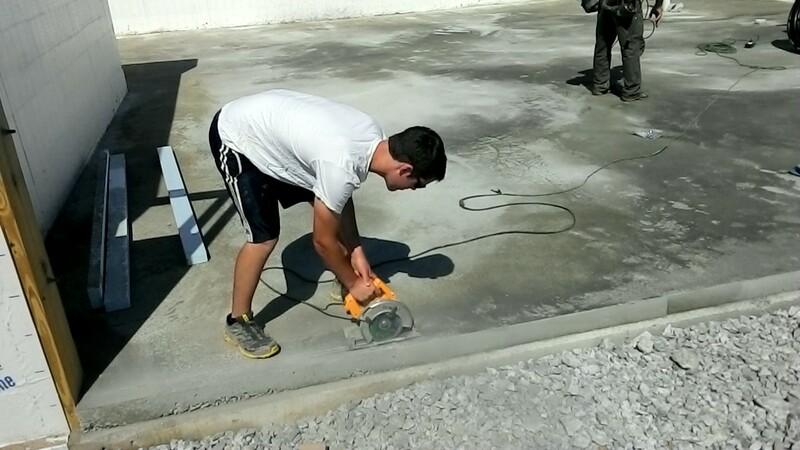 Cutting concrete – saw fitted with a masonry blade. 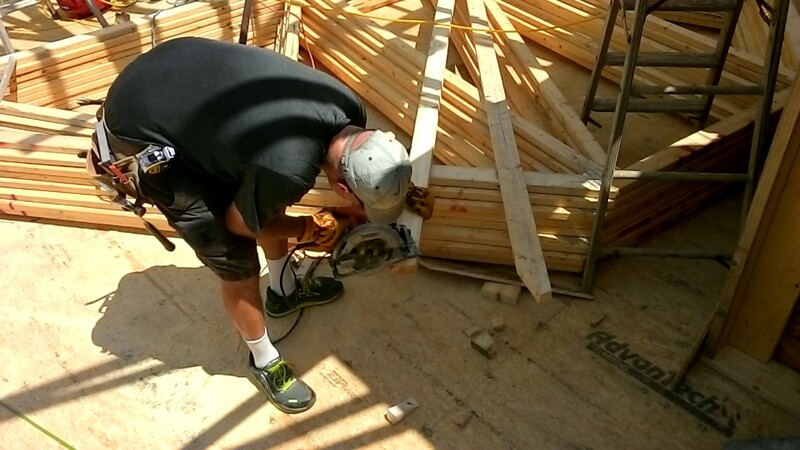 Rumor has it, Colin put his brand-spanking-new circular saw to good use this week, patterning and cutting all the rafters for the 4-on-12 shed roofs. 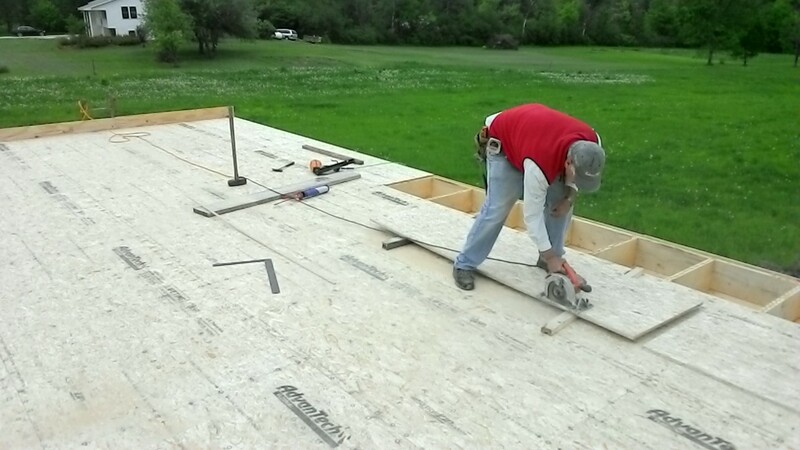 I’m excited to raise those rafters over the final unenclosed bits of the house… and of course, if it turns out a rafter is too long, somebody can just climb up with that same saw and trim it.